German publishing company Nipponart has made two new and exciting DVD and Blu-ray releases. 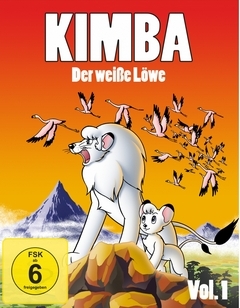 The first one is a new release of the 1977 "Kimba, der weiße Löwe" series that is released both on DVD (10 discs) and on Blu-ray (6 discs), and this is the first Blu-ray release of a Kimba TV series (aside from the 1997 "Jungle Emperor Leo" movie that was released on Blu-ray on December 13, 2016). It is released in 2 boxes - Volume 1 has been released on December 8, 2017, and Volume 2 has followed on February 23, 2018. Update: As an exclusive from Nipponart, the above DVD and Blu-ray sets can be purchased in a "mega bundle" for a slightly reduced price, in which you also get a brand new Kimba plush (pictured right). See the pages of the DVD mega bundle and of the Blu-ray mega bundle. 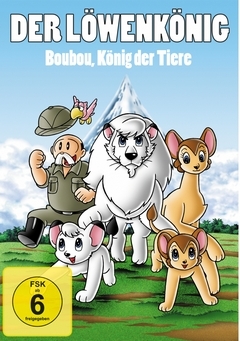 The second one is the first ever DVD release of the 1991 "Boubou, König der Tiere" series (remake of the "Kimba, der weiße Löwe" and the "Leo the Lion" series) that contains 5 DVDs of all 37 episodes of the series. It has been released on May 25, 2018.